Somehow, some way, Spider-Man: Into the Spider-Verse just keeps on getting better. After the film's first teaser debuted in December last year, a follow-up trailer released just the other month, showcasing two more Spider-Men who'll be joining Miles Morales in the film with Spider-Gwen and an older Peter Parker set to take on supporting roles in its story. More Spider-Men are set to be teased at this month's San Diego Comic Con, but another may have just emerged into the frame. 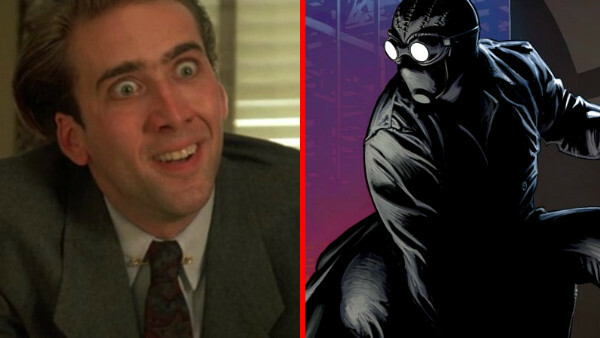 Spider-Man Noir, a version of Peter Parker who took on the Spidey identity in Depression-era New York, looks to be that new character, with none other than Nicolas Cage said to be in the frame to voice him in the upcoming feature. According to Discussing Film, Cage's involvement in the animated project is all but confirmed, with the actor set to join Mahershala Ali, Liev Schreiber, and Shameik Moore as the Noir version of Spidey. The character had already been confirmed curtesy of a leaked Funko listing, but news of Cage's involvement is bound to get fans excited. Spider-Man Noir is certainly one of the more notable alternate versions of Spider-Man, with the Noir comic having garnered praise right across the board during its initial publishing run. Created by David Hine, Fabrice Sapolsky and Carmine Di Giandomenico, the Noir version of the Stan Lee-Steve Ditko superhero has gone on to appear in video games and TV shows too, having been voiced by Christopher Daniel Barnes in Spider-Man: Shattered Dimensions, and by Milo Ventimiglia in Disney XD's Ultimate Spider-Man cartoon.